However, the first time my husband went to use it, he couldn't get the toast to lower. Now, having used this type of toaster for a large portion of my life, I knew that there was almost no way that the toaster was actually broken. It must have just needed some sort of adjusting. So, I shooed my husband out of the kitchen and I checked out the toaster. 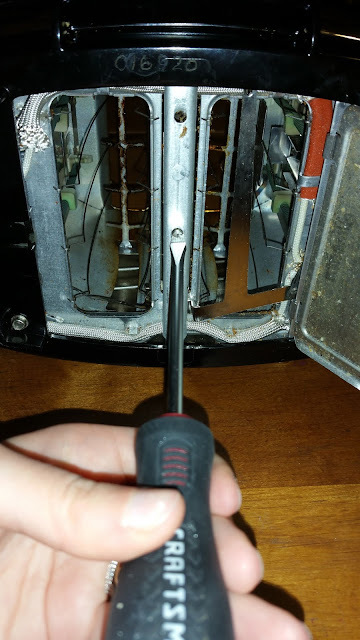 After making a tiny adjustment, our toaster now works as good as new. 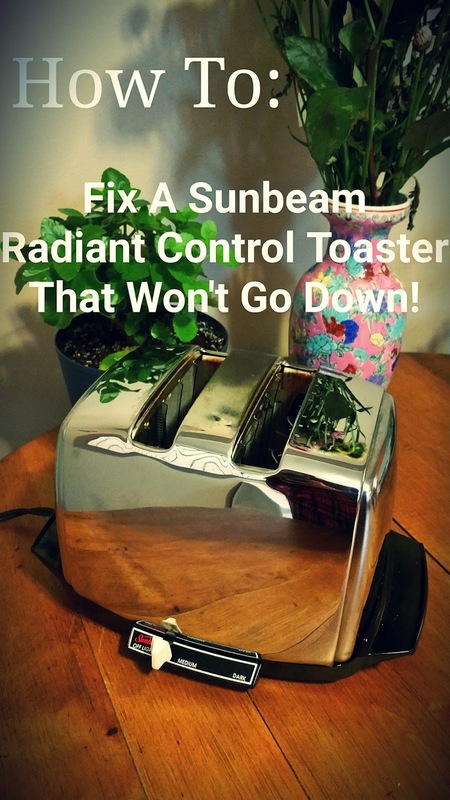 Here is what I did so that you can fix your toaster too! Place a slice of bread in the one-slice side of the toaster. How does it feel when you put the bread in? Does it feel like (A) there is a lot of tension holding the lowering rack in place? OR does it feel like (B) the lowering rack feels very slack and perhaps it doesn't even come up all the way when it is empty? The answer to this question will determine how you will have to adjust your toaster. In my case, the lowering rack was (A) very tense. Remove the bread and unplug your toaster. ALWAYS unplug your toaster when you are going to make an adjustment! Turn your toaster onto its side. 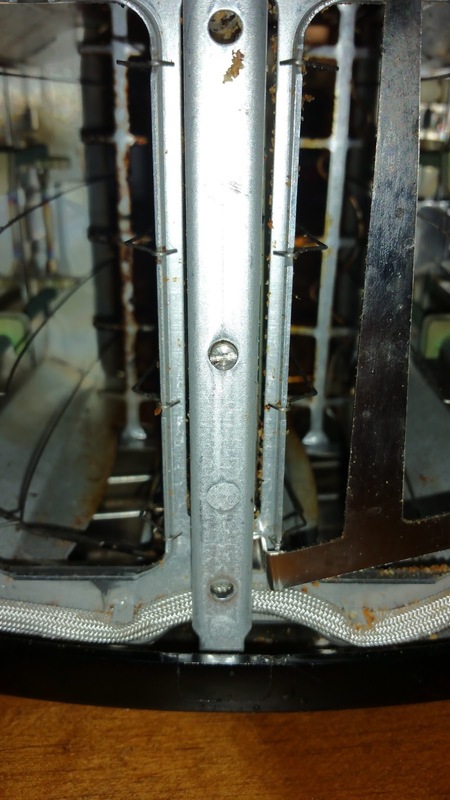 Open the crumb tray using the tab lever. See the crumb tray opening tab on the left. 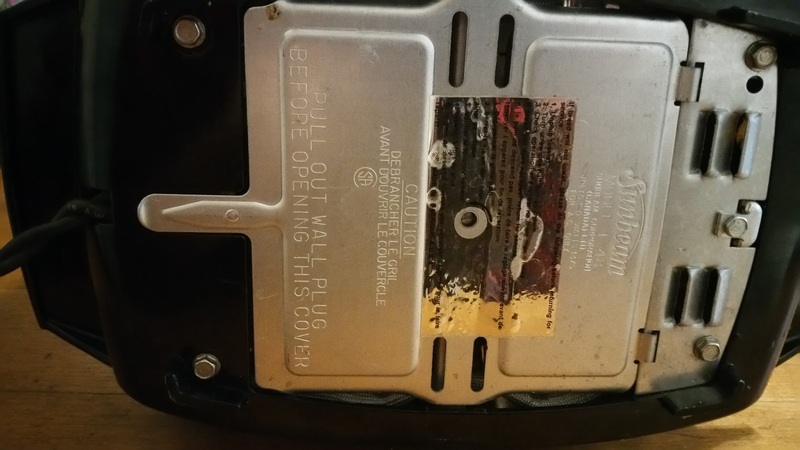 On the center metal piece, between the two slots, you will notice that there is a flat headed screw. This is a tension adjustment screw. The screw in the very middle is the tension adjustment screw. If you were (A) experiencing too much tension from the lowering mechanism, you will need to loosen it. Turn the adjustment screw 1/4 turn counter-clockwise. Test out the toaster. If it still isn't working, turn the screw another 1/4 turn counter-clockwise. It worked for me after the first 1/4 turn. If you were (B) experiencing too much slack from the lowering mechanism, you will need to tighten it. Turn the adjustment screw 1/4 turn clockwise. Test out the toaster. If it still isn't working, turn the screw another 1/4 turn clockwise and then try it again. Is it working now? I sure hope so! Wasn't that a simple fix? 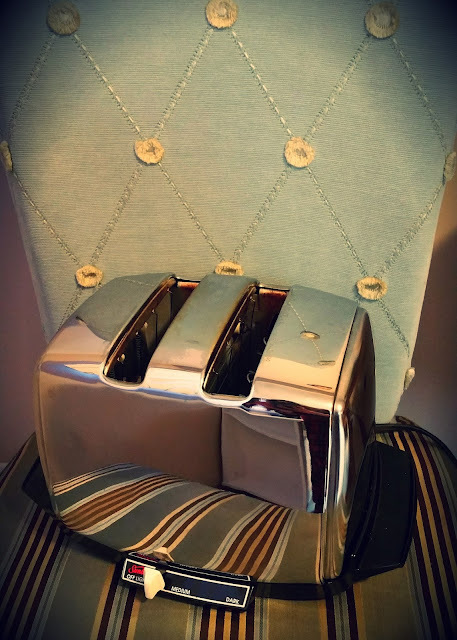 Now you can just relax and enjoy your toast and coffee! But first, leave me a comment below and let me know how it went! I just love these Sunbeam toasters. I wish they had never stopped making them. If anyone has a T-35 kicking around that they aren't using, send it to me! I'm not even kidding. They are incredibly hard to come by here in Canada. I have only seen one of them in my lifetime! Just one more pic of my beautiful T-40. Isn't she pretty?